Paddle a week’s worth of camping gear down the river, and dock your boat on the sands wearing the Keen Women’s Uneek 3C Sandal. Like all Uneek footwear, the 3C Sandal styles adjustable nylon cords for a customized fit. 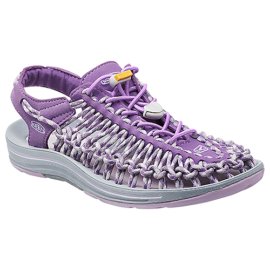 Keen treated the inside with CleanSport NXT organic odor control, so feel free to wear the sandal barefoot. The microfiber footbed feels smoother than a sea stone, and there’s a cushy PU midsole underneath. A razor siping tread gives the rubber sole extra traction on wet surfaces.